A technology that is thousands of years old, knitting is imbued with tradition, myth, and storytelling- to knit is to embody the work of our ancestors. In a hand knitted piece, each loop passes through needles and fingers, leaving small clues about its maker. Depending on our mood and the day, we might knit relaxed loops, tense knots, or daydream and slip a stitch. Unlike machines, we humans have unique quirks and tendencies, and this extends to our knitting. With the proliferation of factory mass production, knits have become standardized, with anonymous stitches that lack any mark of a sentient maker. During this project, I spent a month working in a factory in China to learn about manufacturing and labor. 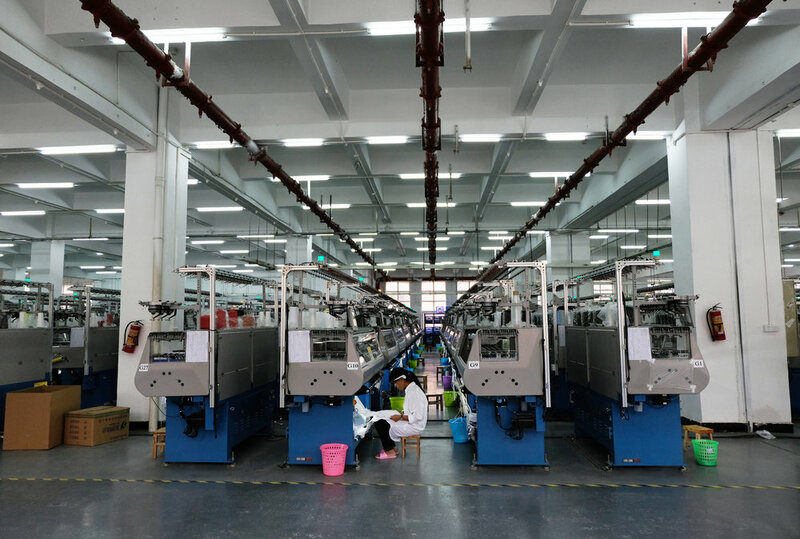 Between rows of hundreds of identical machines, there are still many humans scurrying around to fix jammed needles, trim loose threads, stack and transport finished pieces. I was struck by how these workers live in service of machines, their labor and sweat as ghosts within the identical and perfect end products. This resulting project attempts to reintegrate emotional mark of the worker back into the process of mass production, to begin telling a story of each individual in a landscape of anonymous labor. Automation has many functions, and plays a critical role in our technological advancement, but is it possible to embed automation with gestures as intimate as the mark of a brushstroke in a painting? Taking the cognitive signatures of a human via their EEG signals, I translated these brain activities back into the knitting process. Depending on the EEG signal- the tensility of the weaving was programmed to vary, reflecting the mark of the worker's “cognitive” hand. Depending on the mental stress levels over a day of work, the tensility varies and the fabric ripples in empathy. This project stitches a portrait of the factory worker, through their fluctuating mental states throughout the day- capturing moments of frustration, focus, and meditative work flow. The resulting fabrics tell a story, and each one is unique to the worker and particular moment in time. There are many ways humans express themselves- what does this expression look like in the age of mechanical production? Is there a way to insert the mark of being human into the process? This project offers a moment of reflection- for both the consumer and the worker- to reflect on the labor, both mechanical and human, that is involved in our economy. Data was captured from a period of work in the factory. 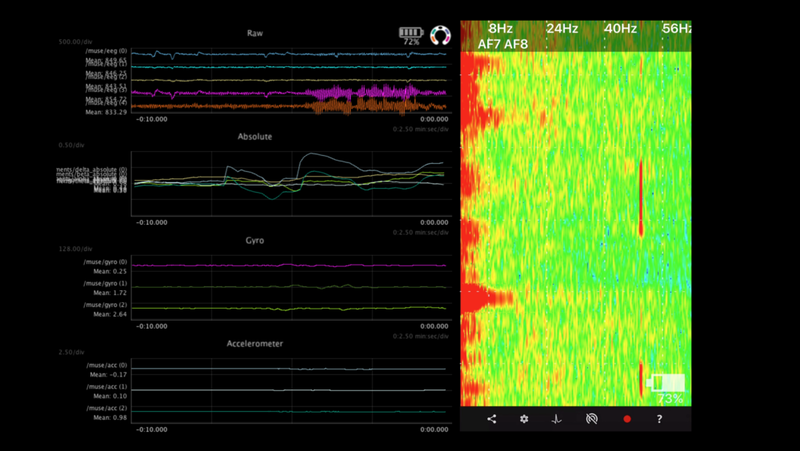 From the spectrogram you can see going from top to bottom the changes of brain activity over time, and from left to right, the range of frequencies captured, from Theta to Gamma. Red indicates high activity, green medium, blue, lowest. Delta and Theta waves towards the left are associated with sleeping, dreaming, and meditative states. Alpha in the 7-15 Hz range is associated with relaxed states. Beta in the 13-30 Hz range is associated with Attention, and focus. Gamma- 30 and above, are associated with hyper Alertness. Depending on the EEG signal- the tensility of the weaving with vary reflecting the mark of the “cognitive” hand. Depending on the cognitive stress levels over a day of work, the tensility varies and the fabric ripples in empathy. Material: Nylon and Polyester. Thoughts from a factory worker translated to EEG data.